Some amount of crystalline quartz is present in silica fume. Typically, this amount is below measurable limits. 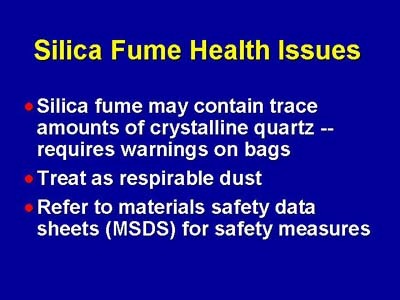 The presence of any amount of quartz requires warnings on bags and material safety data sheets for silica fume. Silica fume should be treated as any other respirable dust; breathing large amounts of the dust should be avoided. Work areas should be well ventilated and appropriate dust masks should be worn. Manufacturers materials safety data sheets will provide specific recommendations. Once the silica fume is incorporated into concrete, there is no potential for dust generation and no particular safety precautions beyond those typically required for working with fresh concrete are required.